Most fittingly, Ortiz did it in his typical fashion also launching 2 clutch homeruns in the same game and propelling the Red Sox to a victory once again. As of now he has accomplished this 2 homers in one game feat 50 times in his amazing career. Pitcher Matt Moore thought he could throw a 80.3 mph knuckle-curve by Big Papi (as his teammates affectionately nicknamed him long ago ) but the ball was promptly launced into the bleachers of Tampa Bays Tropicana Field. It went a total of 432 feet and was measured to leave Ortiz’s bat at a speed of 106 miles per hour. For Ortiz, it was just another in a series of home run walks around the park. Although many games have been played at 1st base by Ortiz, most of his HRs have been hit while starting the game as a Designated Hitter or DH. He is in fact the all-time HR leader for that position. He has never batted in the 1st, 2nd, or 9th slots in the batting order because not only does he slug home RBI’s but he also hits at a high average for a power hitter. Many times over .300! Any manager knows he’s the guy you coming to the plate with men on base. Opposing managers have tried to maneuver the defense with shifts, pitch outs,walks, high pitch counts, and mixing up the roatation on the ball. Somehow ortiz almost always makes contact and pokes the ball to somewhere on the field where ther is not an opposing player. If not there on field tt usually will be an upper deck blast. Nobody can forget his uncanny ability to come through in the clutch. Especially in playoff series against the Yankees, Tigers, Indians, etc. 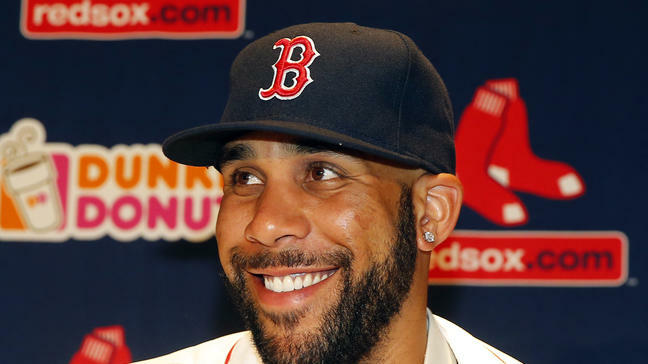 Without his homerun over Tori Hunter and into the Right Field bullpen at Fenway Park in 2013…. the Red Sox would not have advanced past Detroit and into another World Series Win. Oh yeah and in case I forgot to mention….Ortiz is a unique Red Sox Player in that he was a member of the 2004 team, the 2007 squad, AND the 2013 crew that won it all in the World Series.